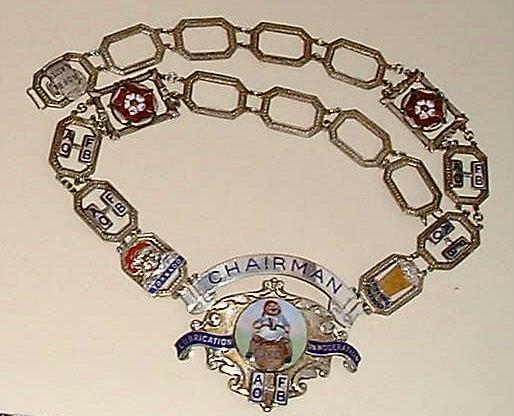 This silver plated Chairman's Chain of Office is very well made, with lots of detailed enamel work, the main front section has an enameled picture of the jolly brewer sitting on a cask of ale, the word Chairman is in royal blue enamel on a scroll above and "Lubrication in Moderation" is also written blue enameled scrolls. The A.O.F.B. logo is on cufflink style oblongs. 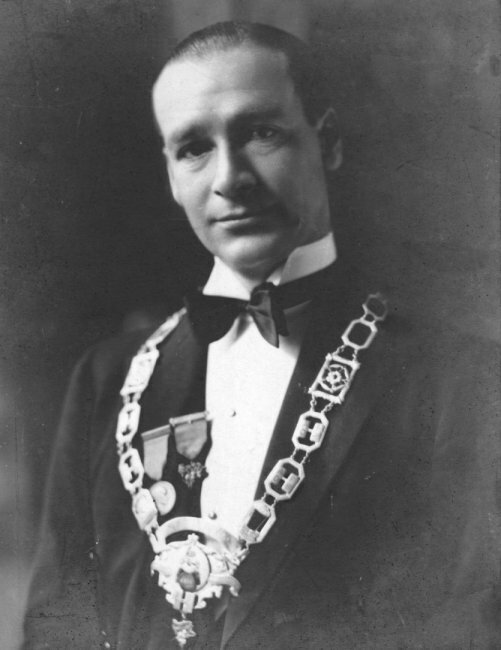 The body of the chain is made up of 17 separate sections, many containing enameled decoration either the logo A.O.F.B. on cufflink style oblongs, there is a Tornado badge and a Monsoon badge, also 2 sections have red white and green enameled flowers. 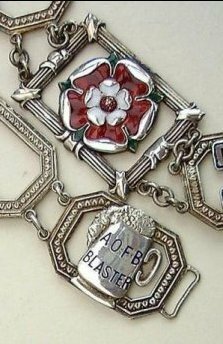 The end link has a blaster badge tankard with A.O.F.B. Blaster. The back of the buckle is marked B'ham Medal Co, Birmingham. Length of the chain measures approx 36" (3 feet) . 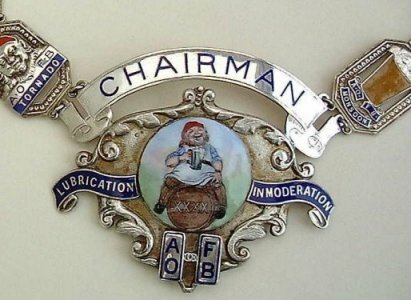 To give an idea of the size of the enamel sections, the front Chairman sections measures approx 3.5" high x 4" long . Description of the chain and the pictures courtesy of Robert Easter. The Breeze Vertical - Stephen Jolly - founder of the Carlton vat and Ambassadors vat. Picture courtesy of his grandson Andrew Jolly.